Words by Miranda C Spencer. Video and photographs by Kirsi Jansa. Jane is worried that her family doesn’t have clean air and clean water. Her adopted daughter Alexis (13) and son Damian (11) attend the K-12 Fort Cherry district school, which is surrounded by shale gas fracking facilities. The wells on two pads, Chiarelli and Toward, are producing while six of 12 wells on a third pad called Yonker are being developed. Altogether, 30 gas wells stand as close as half a mile from the school. They are just 350 feet from some people’s homes. Six years ago Jane didn’t know much about the risks. But then Alexis became irritable and constantly ill with symptoms doctors couldn’t explain, from nose bleeds to rashes to near-daily vomiting to unquenchable thirst. After the girl’s arm locked up at the wrist and elbow, they were referred to a toxicologist. Benzene is a colourless, highly flammable compound widely used by industry, including with fracking fluids. According to the American Cancer Society, it is linked to leukemia and other cancers. Alexis was hospitalised so the benzene could be flushed from her system, and she now carries a portable air monitor to school every day. Jane does not know where the benzene came from. She remembers her doctor asking: “What is this thing they call fracking?” She is now campaigning for more controls on the fracking industry – and urges Scotland to ban it. Jane Worthington is one of many voices on fracking in Pennsylvania. A major US investigation for The Ferret – funded by the digital campaign group, 38 Degrees – has uncovered widespread concerns about health and quality of life where unconventional oil and gas is being exploited. Our reporting team in the US heard numerous warnings about the lessons that should be learnt, and discovered direct connections with Scotland. The Ferret has spoken to a family so worried that they are moving to a frack-free area. We’ve seen evidence of water contamination, talked to a project investigating health impacts and read scientific studies with disturbing conclusions. There’s also a farmer whose business has benefited from the industry but who expressed anxieties about long-term regulation. Our US reporters also heard charges that the industry drive for fracking in Scotland could make things worse, and allegations of thousands of regulatory failures. There’s evidence, too, of corporate influence and power – and an industry that strongly defends what it does. One hundred million years ago, Scotland and the state of Pennsylvania were part of the same massive continent. Over aeons plate tectonics caused them to split and drift apart. The geology explains why both places contain shale formations beneath their rolling landscapes, from which 21st century humans are now seeking to wrest valuable fossil fuels. Since the autumn of 2016, Scotland and Pennsylvania have been reunited – this time, via pipelines. 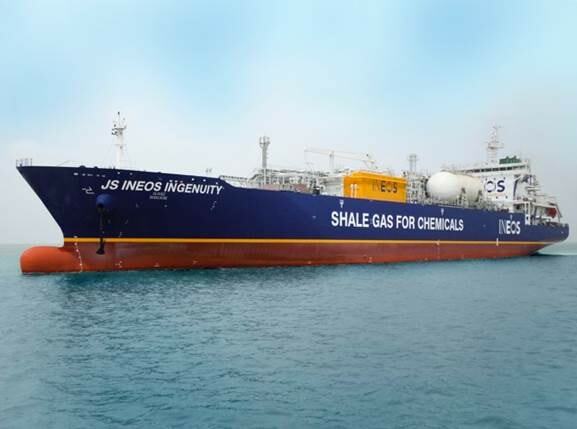 The powerful global forces forging the links are the multinational, Ineos, the world’s sixth-largest petrochemical firm, and its American-based partner, Sunoco Logistics. They are being supplied with ethane, a liquid constituent of natural gas abundant in the Marcellus Shale region of the United States, by the energy companies Range Resources, Consol and others. One pipeline is virtual, running east to west, in the form of supersized “dragon ships”. These tankers ferry cooled and compressed gas liquids back and forth across the Atlantic between the Port of Philadelphia and Ineos facilities at Grangemouth in Scotland to make ethylene, the precursor to many types of plastic. The other pipeline is literal, running west to east. A 350-mile-long Mariner East pipeline brings natural gas liquids from southwestern Pennsylvania to a processing facility at a refurbished facility at Marcus Hook on the Delaware River. And if plans are realised next year, a second Mariner pipeline that could quadruple the capacity to deliver gas liquids abroad will be up and running. The shipping scheme and pipeline represent investments of about $4.5 billion. They are financed by more than 50 banks including Barclays and HSBC, according to data collected by public-interest group Food and Water Watch. It’s all part of a 15-year deal that, according to Ineos boss Jim Ratcliffe, will aid his company’s ambitions to dominate the plastics industry. Assuming, that is, fracking is allowed to proceed and the Scottish Government lifts its two-year moratorium after its public consultation ends on 31 May. Extracting more climate-disrupting fossil fuels is likely to be lucrative for those who own and control the industry. But for those in its path on both sides of the Atlantic, there will be costs. Pennsylvanians, who have grown accustomed to coexisting with yesterday’s oil, steel, and coal industries, are already paying them. Scots, from a distance, are nervously asking questions. Is fracking worth it? To find out, The Ferret travelled around Washington County in southwest Pennsylvania, where the gas is extracted and the pipelines begin. We asked about the human and community impacts of the fracking that fuels the Ineos deal in this politically conservative part of the state, with a population of 208,000. The gateway to Washington County is through Pittsburgh, Pennsylvania’s second-largest city. The rusty-looking former steel capital lies in a valley at the intersection of three rivers, once highly polluted by acid mine drainage and untreated industrial waste. Though industry here has been displaced by growing health care, tech and bioscience sectors, in 2017 the American Lung Association’s annual State of the Air report ranked the Pittsburgh area eighth among 25 US cities most polluted by dangerous sooty particles. Drive less than an hour south, though, and the rust and old factories give way to the green hills of farm country, with dramatic vistas and steep slopes reminiscent of Scotland. There are Pennsylvania towns with Scots among their earliest settlers, such as the county seat of Washington. But here, the rural lifestyle is rapidly giving way to industry. It’s not uncommon to see a ‘no trespassing’ sign and yellow pole announcing a well pad little more than 400 meters from a bucolic sheep farm. Sometimes the gas industry’s presence is glaringly obvious. Paths for the new Mariner East 2 and its feeder pipelines have gouged gashes through woods, and towering rigs have been set up to drill wells that will be fracked to disgorge gas. Elsewhere, it’s subtler: finished wells, compressor stations, and the pipe-cleaning devices known as pig launchers, blend in among other buildings or are hidden behind a fence or a patchwork of trees. But for those who live amidst them, the changes are hard to ignore. The first step on the 3,500-mile Ineos/Sunoco pipeline between Washington County and Grangemouth is extraction. Much of Marcellus Shale gas lies between one and two miles below private property, whose owners may or may not own the coveted mineral rights energy companies lease for development, in exchange for royalties or other payments. This means that landowners can find their backyards and neighbourhoods fracked without their permission – or even any notice. Zoning ordinances on industrial activity vary from municipality to municipality – and are sometimes nonexistent. So, how close to homes, businesses, and public buildings fracking infrastructure can be sited, depends on where one lives. According to a 2015 report from the research group PennEnvironment, nearly 53,000 children under the age of 10 in Pennsylvania live within one mile of fracked wells, more than 8,000 of them in Washington County. When the Bjornson family bought their white farmhouse at Scenery Hill in Pennsylvania 13 years ago, the area was totally rural. But now the two parents, three sons, a daughter, five cats and their 12.5 acres of land are completely surrounded by the fracking industry. 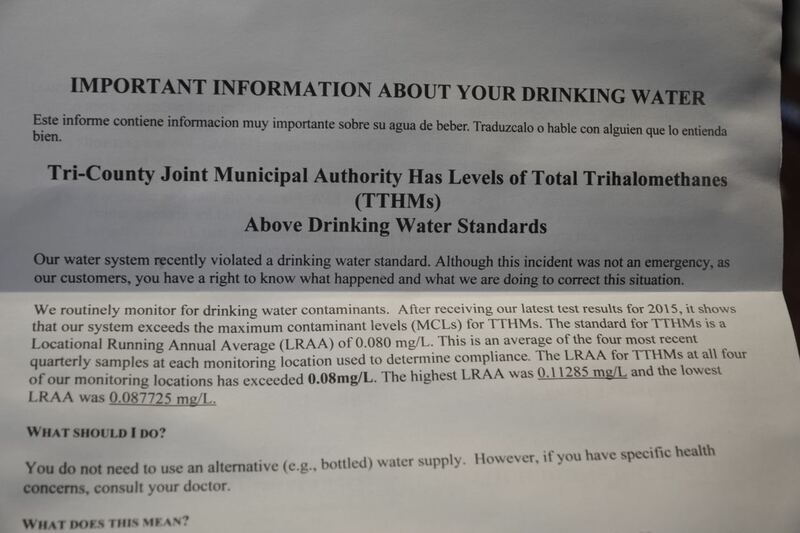 The Bjornsons have to use a special filter on their tap water, because the public utility sent a notice warning that it contains trihalomethanes, a toxic byproduct of wastewater treatment that has been linked with fracking. Lois has noticed odd chemical smells and has seen gas flaring in the distance. And when active drilling and fracking take place, she says her children have had strange symptoms. Ten-year-old Gunnar gets leg swelling and nose bleeds, and seven-year-old Odessa has eczema. “At one point, it looked like she had been scalded,” says Lois. Some of Washington County still retains it rural character despite fracking, and that includes Dale, Marcy, and Nigel Tudor’s 100-acre Weatherbury Farm in Avella. The Tudors raise grass-fed beef and lamb and grains they mill into flour and sell to posh restaurants. They also lease some of their land to Range Resources for underground lines that bring gas from the shale up to wellheads. According to the Tudors, fracking has helped underwrite their farm business. Last year, says Marcy, who spent her junior year of college at Glasgow University, their net farm income was minus $25,703 but their net fracking-related income was plus $40,049. As an organic operation, Weatherbury Farm must meet strict federal standards for how its meat and crops are raised, including freedom from pesticides and industrial contaminants. So far, they say, there have been no spills or other accidents connected to the wells near them, and their water has tested negative for contamination. As for the coming Mariner East 2 pipeline, he’s glad he doesn’t live near it, due to the potential for long-term deterioration. “Unfortunately our regulatory system doesn’t keep good track of these things forty and fifty years down the line,” he points out. All of the Tudors tend to think the ethane exported to Scotland would be better developed as a domestic commodity. Nigel is nervous about Ineos’s dragon ships. “It’s a potential terrorist target, like a floating atomic weapon,” he says, shaking his head. After gas has been extracted, it has to be processed. Besides methane, the “wet gas” found in Western Pennsylvania also contains liquids: butane, propane, pentane – and ethane, which is used to make plastics. Before the natural gas liquids can head for the Mariner pipelines, they must be separated through a process called fractionation. This is done at the MarkWest Houston facility, sprawled across an enormous field in Chartiers on the outskirts of Washington. Mariner East 1 originates near here, and Mariner East 2, which begins in eastern Ohio, is due to pass through not far from the plant. About two miles away and up a hill dotted with newer, up-market homes lives Suzanne Bastien and husband Mark, who run a successful beer-distribution business. Twenty-five years ago, they bought a five-acre property with a scenic view in Hickory, where Mark built them a log-cabin and barn to host family and friends. Then, in 2011, construction began on the MarkWest facility. It’s not just that she can see the plant from her backyard. On a regular basis, she says, the facility emits strange odours and has changed the quality of the air. Worse, there have been frightening incidents. In 2013, she saw dark clouds of smoke spewing from it on multiple occasions, which, she says, sometimes made her vomit. It turns out that the plant, which had recently doubled its production capacity, was improperly flaring chemicals, leading to a $150,000 fine from the state regulatory agency, the Department of Environmental Protection. In 2014, during a rainstorm that caused widespread flooding, the plant was struck by lightning and had a gas leak, but the Bastiens were not among those evacuated. Then there were issues with her cats, and several died. One called Molly, had to have a paw amputated due to bone cancer. Another got lung cancer, which Suzanne’s veterinarian told her was extremely rare. “The fact that we’re breathing this does have me concerned,” she says. Suzanne has had air monitoring devices installed around her home to measure for dangerous fine-particulate matter, with the help of the nonprofit group Southwest Pennsylvania Environmental Health Project (SWPEHP). She expects results soon, but notes that the monitor often showed “spikes” between midnight and 6am. Hydraulic fracturing, or ‘fracking,’ is a process that is used to extract natural gas trapped in small holes in rocks deep below the ground. A borehole is sunk and then high-pressure fluids are used to force open splits in gas bearing rocks. The gas that is produced is then returned to the surface through the borehole. Advances in drilling technology, which allow bore holes to be drilled at an angle, or even horizontally underground, have meant that a far larger area can be commercially exploited from a single well. These drilling techniques also mean that gas deposits that were once considered too difficult to access could now be commercially viable. Proponents of fracking argue that it promotes energy independence and can create employment and other local economic benefits. However, concerns over the environmental impact of the extraction technique have lead some US states, as well as a number of European countries including Scotland, to ban it on a temporary or permanent basis. It is estimated that there could be as much as 134 trillion cubic feet of gas in the central Scotland deposits. The gas bearing rocks in these deposits are located at least 2300ft below the ground. It is not known how much of this gas could be recovered commercially, were the Scottish Government to lift the fracking moratorium that is currently in place. After more than a decade with intensive gas development in their midst, Pennsylvanians have grown weary of the health and environmental impacts, and the arguments they provoke. One problem is that definitive pathways from exposure to symptom are hard to prove. Stories like those told by Jane, Lois and Suzanne can be dismissed as anecdotal, explains Raina Rippel, SWPEHP’s executive director. There are rarely any baseline measurements of air, water, or previous health history to compare them to, and fracking is a relatively new enterprise, so long-term, systematic health studies aren’t yet available. So when the industry is accused of contamination, they have plenty of wiggle room to argue they aren’t responsible. But Raina believes the amassing anecdotes should not be ignored. SWPEHP was founded in 2012 to provide help to people who believe their health has been, or could be, harmed by unconventional oil and gas development. Located in a strip mall in McMurray, Pennsylvania, its mission is controversial in a region filled with fracking businesses and their backers. Raina, whose background is in community organising, manages a staff including nurse practitioners, environmental health experts, and outreach specialists to provide clients with counseling, referrals, and literature. Two days a week, clients are seen for physical exams after answering a detailed form about their life and health before, during, and after fracking came to town. The organisation also helps people do home-exposure assessments and provides air monitoring equipment. After five years, says Raina, they’re seeing recognisable patterns among the people they serve. Most common are respiratory symptoms associated with air pollution, such as coughs and shortness of breath, and stress-related ailments, such as anxiety. Since the market for ethane began developing, she’s noticed additional community disruption as trees are clear-cut to make way for the Mariner East pipelines. What bothers her more, though, is the non-responsiveness of the state’s regulatory agencies. “People have been let down,” she asserts. 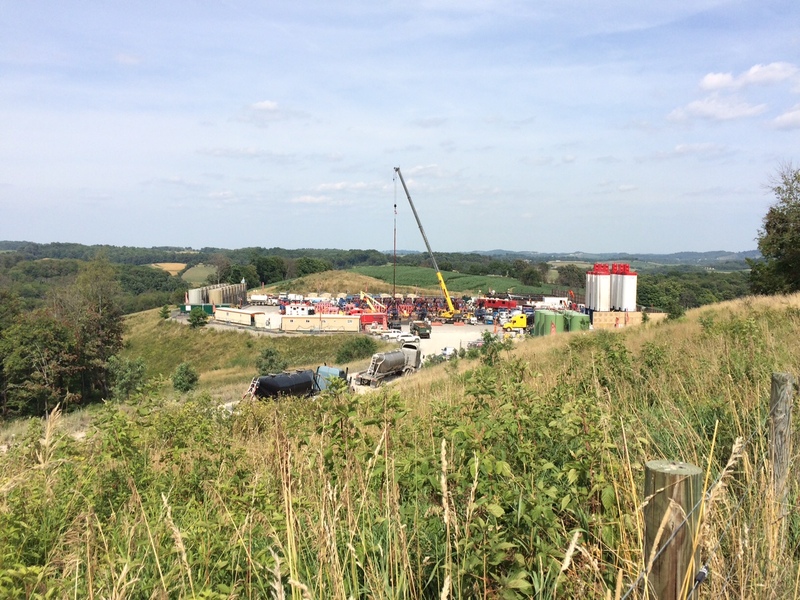 That stonewalling is one of the reasons SWPEHP launched an online health registry in May to collect self-reported health and exposure information from people who live near fracking. Over time, it will allow people to compare their symptoms to those of others’, and SWPEHP to build a body of data that researchers and public agencies can use for further study. Since the height of Pennsylvania’s fracking boom between 2005 and 2014, health care organisations, universities, and non-governmental groups have produced research linking illness with living near or working in natural gas development, or with chemicals known to be used in fracking. The problems include everything from increased accident and emergency visits to heightened risks of developing childhood cancers. The evidence offered in these individual studies has recently been strengthened by more comprehensive studies examining the body of medical literature, including one in the peer-reviewed journal PLOS One. Three new studies by environmental health scientists, using longer-term patient electronic records data collected by Pennsylvania’s Geisinger Health System, have looked at the health of mothers and children. The studies found that patients living near high levels of gas development had higher rates of premature births and low birth weights, aggravated asthma, and more sinus, headache, and fatigue symptoms than patients in areas with less fracking activity. In October 2016 the Pennsylvania Medical Society, a health advocacy group, unanimously called for a moratorium on fracking and urged the state government to establish an independent health registry. At the same time, the campaign group Food and Water Watch (FAWW) has been monitoring the Ineos project from both sides of the pond. In May, it published a report, “The Trans-Atlantic Plastics Pipeline: How Pennsylvania’s Fracking Boom Crosses the Atlantic,” describing the additional environmental and health burdens that it says a burgeoning plastics industry could bring. The report argues that the Ineos export strategy will drive more fracking in Pennsylvania, with accompanying water and air pollution. In Scotland, it claims that the industrial process of “cracking” ethane into ethylene for plastics will release dangerous air pollutants. These include climate-wrecking carbon dioxide, as well as nitrogen dioxide and hydrocarbons linked to respiratory illnesses and cancer. The report also notes that petrochemical manufacturing creates plastic waste, including small pellets called nurdles that are littering shorelines across the UK. All of the companies involved in the trans-Atlantic gas pipeline, the report charges, have poor environmental records. As The Ferret reported, the Ineos Grangemouth complex has been repeatedly cited by Scottish authorities for emissions and pollutions violations, along with workplace safety violations. On 2 May 2017, the Ineos petrochemical plant in Grangemouth had an ethylene leak that forced the evacuation of employees. According to the report Range Resources, the first company to horizontally frack a well in Pennsylvania in 2004, has been charged with over 500 health and safety violations between 2005 and 2016 and has been fined almost $21 million by state regulators. An analysis by the news agency Reuters suggested that the other company involved, Sunoco, has had a higher rate of oil spills than any of its competitors in the US. 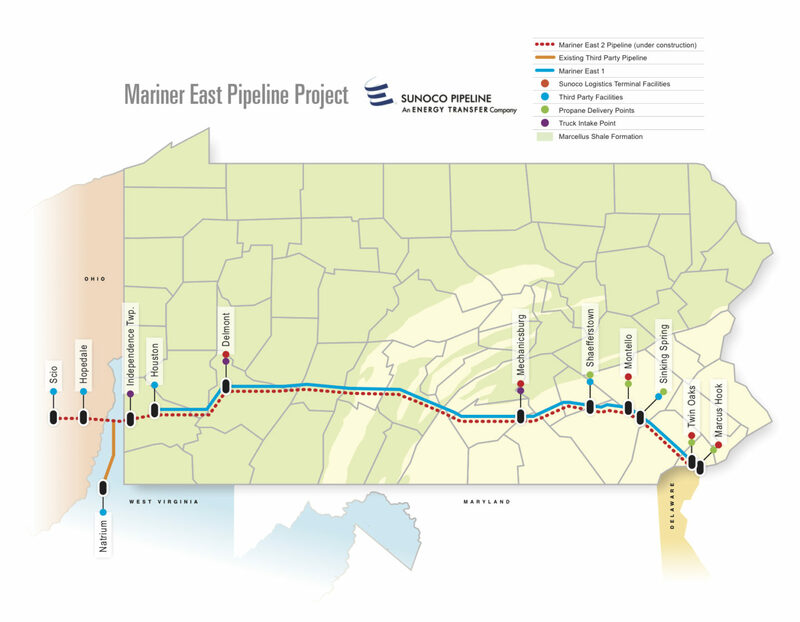 Sunoco Logistics, which is building the Mariner East 2 pipeline, recently completed a merger with Energy Transfer Partners, the company behind the controversial Dakota Access pipeline under construction in the US Midwest. Protests against the pipeline earned international headlines because its path is set to cross the Standing Rock Sioux Reservation and near the lake that provides the tribes’ drinking water. Range Resources did not respond to requests to comment. But last October, when conflict erupted over an incident in which company trucks allegedly forced school buses off the road, Range officials told local TV news station WPXI that they were abiding by all pertinent rules. The Department of Environmental Protection (DEP) and its Office of Oil and Gas Management and Compliance and Enforcement Division, which oversee fracking in Pennsylvania, also did not respond to our questions about the FAWW report and other criticisms. State governor Tom Wolf, a self-professed environmental advocate, officially supports ongoing shale development. The DEP has been accused of failing to properly enforce the rules for unconventional oil and gas development. A campaign group, PennEnvironment has published “fracking failures” reports annually. The 2017 edition reported that over eight years, fracking companies in the state committed more than 4,000 environmental and public-health violations, or 1.4 violations a day. However, only 17 per cent of the violations were issued a fine, the average of which was only about $5,000. Rules intended to protect communities and ensure a responsible and well-ordered industry are stronger and more comprehensive than they used to be, according to the DEP website. They fall under state Act 13, which has been revised after a court ruled that parts of it contravened the Pennsylvania constitution. Under president Donald Trump – like Ineos chief, Jim Ratcliffe, a brash billionaire businessman – Pennsylvanians will need to be vigilant about keeping the gas industry accountable. The Trump Administration has begun dismantling the federal Environmental Protection Agency budget and staff. It wants to eliminate or weaken regulations while simultaneously pushing for a revival of the coal industry and full exploitation of fossil fuels to protect and create American jobs. In a region like western Pennsylvania, whose economy was built on extractive industry, jobs are usually top of the agenda for government leaders and the public, according to lifetime resident Mario Leone, a borough manager in nearby Beaver County who has also spearheaded many local sustainability initiatives. Since the Ineos project requires fracking to continue apace in western Pennsylvania for a decade or more, those who can make money from it are likely to continue to support it. Everyone knows of a landowner who has become wealthy. The rewards aren’t what they used to be, however. Dale Tudor of Weatherbury Farm says Range Resources and many other companies are deducting more and more of their costs from rights-holders’ royalties. Where once 10-15 per cent was held back from his payment, now it’s closer to 50 per cent. And if a well is not productive, payments are little to nothing. In the second quarter of 2016, 52,531 of Pennsylvania’s approximately 13 million residents were employed directly or indirectly in natural gas extraction development. In terms of revenue, Pennsylvania has collected a total of $1 billion in “impact fees” since 2011. However, the fees, a portion of which go back to communities, have dropped in recent years as fracking has fallen off. One group of people that’s been well rewarded by the fracking industry is Pennsylvania officials, particularly state legislators. In the first half of 2016, according to the monitoring group Marcellus Money, they received almost $464,000 in campaign donations from energy companies. During that period, natural gas companies also spent about $3.5 million on lobbying. Consol and Range Resources were among the top seven donors. Industry influence happens at the local level too. Campaigners allege municipal government leaders in gas-rich areas lease their land for fracking or related infrastructure. This makes them careful not to ruffle company feathers and encourages “rubber stamping” land use permits, critics say. Gas companies also frequently fund municipal projects such as hospital wings or donate to school programs in the communities where they are embedded. Opponents believe these activities are an attempt to buy cooperation and silence criticism. Her daughter’s illness, and talking to others in the area who said they had similar problems, turned Jane into an activist. She works in a Protect Our Children Coalition, advocating a minimum distance of two miles between gas wells and places that house vulnerable people, such as schools and nursing homes. They also seek stricter rules on methane emissions and the better enforcement of existing regulations. Her immediate worry, though, is for the students at Fort Cherry School, encircled by fracking installations. She points out that the paved, chained evacuation road Range Resources built near the school’s parking lot, is the only exit other than the building’s main driveway, and leads towards a well. Miranda C Spencer is a freelance journalist based in New Jersey who formerly reported on fracking for a western Pennsylvania energy news outlet. Kirsi Jansa is a Pittsburgh-based documentary filmmaker, and the producer of Gas Rush Stories. This is part one of a major two-part investigation funded by the digital campaign group, 38 Degrees, under a memorandum of understand giving The Ferret full editorial control. Additional photos thanks to Lois Bjornson, Suzanne Bastian and Ineos.